Google holds regular competitions to encourage involvement in improving the security of the Chromium project. Contests like Pwnium helps to better patch specific exploits and issues to make Chromium even more secure. This year Pwnium 4 will once again set sights on Chrome OS, and will be hosted in March at the CanSecWest security conference in Vancouver. — $110,000 USD: browser or system-level compromise in guest mode or as a logged-in user, delivered via a web page. — $150,000 USD: compromise with device persistence: guest to guest with interim reboot, delivered via a web page. Past Pwnium competitions have focused on Intel-based Chrome OS devices, but this year researchers can choose between an ARM-based Chromebook, the HP Chromebook 11 (WiFi), or the Acer C720 Chromebook (2GB WiFi) that is based on the Intel Haswell microarchitecture. The attack must be demonstrated against one of these devices running the then-current stable version of Chrome OS. Participants need to register in advance for a timeslot. To register, e-mail pwnium4@chromium.org. Registration will close at 5:00 p.m. PST Monday, March 10th, 2014. Only exploits demonstrated on time in this specifically-arranged window will be eligible for a reward. 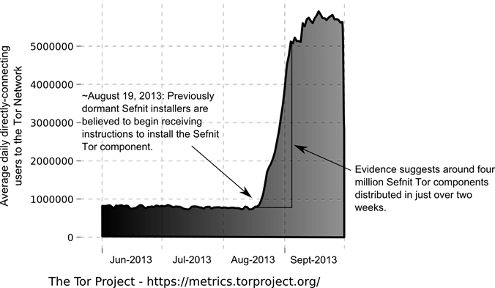 The 2013 list of worst passwords, influenced by postings from the Adobe breach, demonstrates the importance of not basing passwords on the application or website being accessed. 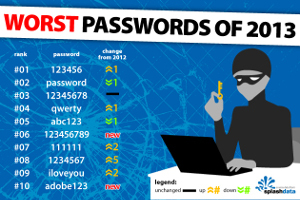 SplashData has announced its annual list of the 25 most common passwords found on the Internet. For the first time since SplashData began compiling its annual list, “password” has lost its title as the most common and therefore Worst Password, and two-time runner-up “123456″ took the dubious honor. “Password” fell to #2. According to SplashData, this year’s list was influenced by the large number of passwords from Adobe users posted online by security consulting firm Stricture Consulting Group following Adobe’s well publicized security breach. “Seeing passwords like ‘adobe123′ and ‘photoshop’ on this list offers a good reminder not to base your password on the name of the website or application you are accessing,” says Morgan Slain, CEO of SplashData. “Another interesting aspect of this year’s list is that more short numerical passwords showed up even though websites are starting to enforce stronger password policies,” Slain said. For example, new to this year’s list are simple and easily guessable passwords like “1234″ at #16, “12345″ at #20, and “000000″ at #25.